Forty members of the Aspen Choral Society performed "Messiah...Refreshed" with an international contingent of choirs at Carnegie Hall on Nov. 27. When: Friday, Dec. 14 (Basalt); Saturday, Dec. 15 (Aspen); Sunday, Dec. 16 (Glenwood). All performances 7 p.m.
Ascending the risers for a dress rehearsal of Handel’s “Messiah” over Thanksgiving weekend, Paul Dankers kept his eyes down. He focused on following the singer in front of him, not tripping up the steps and holding on to his binder of sheet music. But then Dankers reminded himself this wasn’t just any “Messiah” run-through. Hours later, Dankers and three-dozen of his fellow local choir members performed the Christmas classic for a sold-out crowd of 2,800 in the legendary Stern Auditorium at Carnegie Hall. “That was like, ‘OK, I have to bring my A-game because there are a lot of people here,’” Dankers said. The choral society was one of 18 choirs from around the world selected by Distinguished Concerts International New York to join forces for the eighth annual “Messiah…Refreshed” concert. The one-day performance featured a 250-voice choir and full symphony on America’s most storied stage. After the tremendous honor of performing at Carnegie Hall, the choral society is coming home for its 41st annual local performance of “Messiah.” The choir will tour the Roaring Fork Valley on Dec. 14-16 with concerts in at the Wheeler Opera House in Aspen and churches in Basalt and Glenwood Springs. The Carnegie concert raised the national profile of the local choir and rewarded its dedicated singers, some of whom have been in its ranks for all four decades. But, Dankers noted, the anonymity of performing in such a huge group for a massive crowd also made him long for home. Before the Carnegie Hall performance, the “Messiah…Refreshed” singers — with choirs from across the U.S. and Canada, South Africa, Qatar and Hong Kong — rehearsed for two intense days in New York with conductor Jonathan Griffith. For the local concerts, the Aspen Choral Society spends months in preparations that are undergirded by decades of standing side-by-side and bringing Handel’s majestic composition to life together. 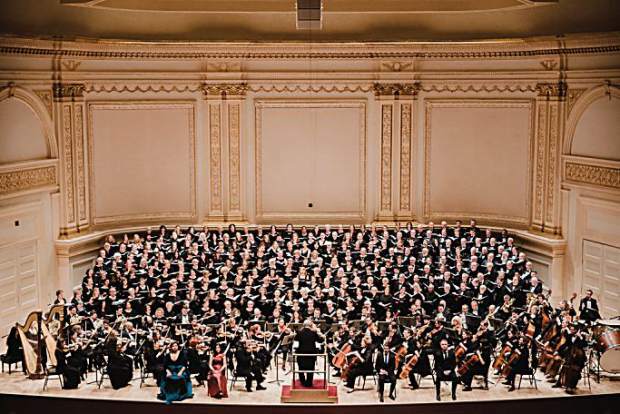 The grand spectacle of a sold-out Carnegie Hall may signal the pinnacle of musical achievement. But there’s no place like home.